Oh boy, have we got a trip for you that’s worthy of being put at the top of your bucket list! We’ve always loved manatees, and had the good fortune to see them growing up as kids. But a couple years ago, two of my high school Marine Biology students decided to go swim with manatees in Crystal River, Florida over spring break, and they convinced me that it was an experience of a lifetime that I MUST put on my bucket list. So just last month, we finally got the chance to go have an experience of our own. 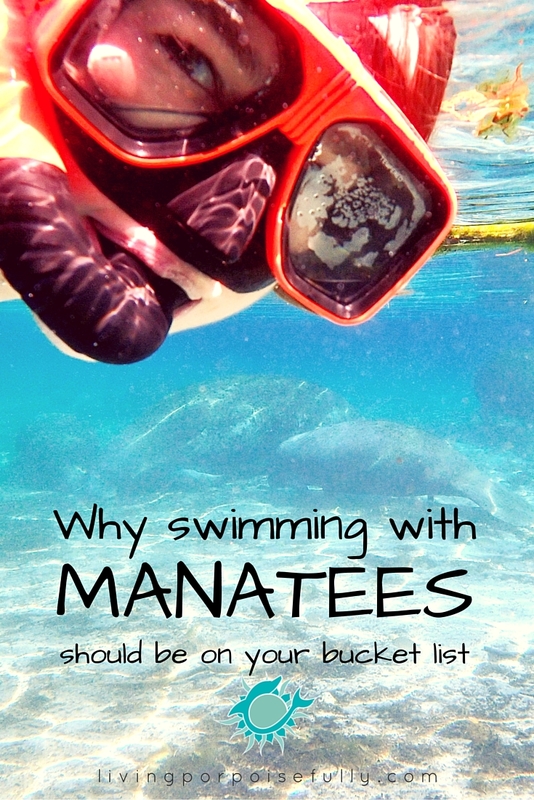 We headed for Crystal River, Florida to swim with wild manatees! After getting our mask and snorkels adjusted, we got off the tour boat into the shallow crystal clear waters and were immediately greeted by a sight of several manatees gathering! Right away, it hit us at how large these gentle creatures really are. It made us realize why this experience should have been on our bucket list long ago. Reason #1: It connects you with nature, but not in your everyday-kind-of-way. Sure, many of us enjoy a hike or walk on the beach to get in touch with nature, but chilling out with manatees definitely takes the cake. Being next to the manatees was the ultimate stress reliever. They’d relax on the bottom, take turns drifting up to the surface to breathe, munch on vegetation, and investigate us two-legged creatures when they got curious. Reason #2: It is an adventure of a lifetime. Donning a mask, snorkel, and wetsuit, and swimming into the world of blue to encounter wild manatees is something unlike anything you can do on land. Being immersed in this very different world brings a new perspective, heightened appreciation, and enraptured fascination! Reason #3: You don’t have to be a dive expert. One of the most fantastic parts about this trip is that it’s the perfect intro-level snorkel experience for almost any age! There’s not a ton of exertion required (in fact, one of the secrets to an awesome encounter with a manatee is to relax and float calmly). Plus, for those of us who get seasick, it’s a non-issue being in such calm waters. Reason #4: It leaves you humbly in awe. There’s just something so deeply soul satisfying at seeing these gentle, yet massive, animals up close that it just puts you in awe. It made us feel quite small, and gave us even more respect for the amazing creatures that they are. Who couldn’t love such a sweet, peaceful creature? So have we convinced you yet? If that wasn’t enough, you might even get lucky enough if a manatee approaches you and says “hi” with its whiskers! It’s the ultimate up-close experience that you won’t be able to stop talking about and will remember for a lifetime. Reason #5: It bonds you with the ocean and its creatures. It’s experiences like these, orchestrated in a respectful encounter, that are incredibly compelling in helping humans recognize the need to protect these wild animals! It’s so important to remember that they are wild animals and they are not to be harassed or chased, and only touched if they approach. We were relieved that our tour company and volunteers with the wildlife sanctuary did a fantastic job educating and enforcing respectful interactions, and making sure that the manatees were treated respectfully. Book an early morning tour. The earlier you go, the less busy it is and the more likely you’ll see manatees. Keep in mind that the colder it is, the more manatees you’ll see in Crystal River. While it’s possible to see manatees all year round, the best chances are during the colder months. The manatees need to stay in warmer waters since they don’t have much body fat! The waters of Crystal River are naturally warmed by nearby hot springs. The wetsuit is a huge help, and some tour companies offer hot chocolate on the boat after! We had a fantastic experience with River Ventures, and highly recommend them. (We don’t get any perks or anything for saying so!) For $54 per person (at the time we went), we got the experience of a lifetime. We absolutely fell in love with these incredible creatures and it wouldn’t take much to twist our arm to go back and have another visit with them. So go on, don’t think about it any longer and get this on your bucket list calendar right now! And, if you know someone might love to do this but needs a push, send this article on to them so that they can make it happen. Life is so short, so live it fully! I want to do this!! Beautiful, clear water! Awesome post!